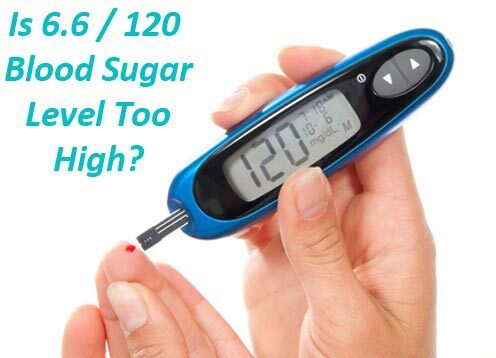 Is 6.6/ 120 Blood Sugar Level Too High? I was wondering if a 120 blood sugar level is too high? For those measuring blood sugar in mmol, 120 is equal to 6.6 mmol/l. So let's look at a blood sugar chart, then have a chat about optimal levels. As you can see from this chart, a level of 6.6/ 120 is not too high. Ideally you do want it under 110 (6.1) for your morning fasting level. But lots of people do find their morning levels higher. Read this to find out why. You can also see that having a 120 (6.6) reading 2 hours after meals would be excellent and before bed a reading of 120 (6.6) is in the mid range too, so that's perfectly okay. The most important number to keep in mind is 140 (7.8). You do not want to let your blood sugar levels get above 140 (7.8) for any prolonged length of time. When your blood sugar goes over 140 (7.8) this is the ‘danger' level. Having a blood sugar above 140 (7.8) for prolonged periods does some critical damage that can lead to diabetic complications, which nobody wants. So the target is always under 140 (7.8) after meals, 120 (6.6) is even better. Although 120 is not too high, ideally you do want to gain very good control of your blood sugar levels by following a healthy diet and doing regular exercise. If you can get your fasting level between 90-100 mg/dl (5-5.5 mmol/l), and your 2 hour reading between 120-140 mg/dl (6.6-7.8 mmol/l) then that is optimal. These are goals to work towards. Hope this has helped answer your question. I’m 33 years old and came to know I have pre-diabetes 2 months back. I’m doing exercise and losing a weight. Is it possible to come to normal again? Absolutely with a proper diet, exercise, and weight loss you can achieve normal sugar levels. Diabetes (or prediabetes) isn’t reversible from a diagnostic standpoint, meaning once you have it you have it, but by taking control of your prediabetes now you can prevent it from progressing into full blown diabetes. Check out this article for a little more insight into this. Hi, I’m 53 and began a Ketogenic life style. I was 350 pounds 6/28/18, bg’s ranged 145-220 and I was taking 250 units slow and quick insulin each day. I was eating a 2000 calorie a day diet w/45-55 carbs per meal. 9/28/18 I am at 300 pounds, bg’s are 89 fasting and max 120 2 hrs after meals. I haven’t used insulin since 7/20/18. I now eat 70% fat, 25% Protein and 5% carbs that include 3-4 cups of no or low starch veggie. I am glad you have found something that works so well for you, Mike. Our meal plans are not keto, we encourage a low carb lifestyle and many of our members find eating 50-80 grams of carbs daily results in optimal results. In our experience, members are getting the same results without needing to be so strict with cutting carbs. Sometimes having more variety helps people sustain a good eating plan long term. We also believe more vegetables in the diet is important, and it can be hard to follow a true keto diet and eat adequate veggies at the same time. Just things to consider, but again, I am glad what you’re doing is working for you! Hi I’m new to all this having been diagnosed type 2 just a couple of months ago. I had breakfast of boiled egg and wholemeal toast and 2 hours later my blood sugar was 9.3 mmol/L is this really bad? Terry, the ultimate goal is to maintain (near) normal levels, so the closer you can get to 7.8 mmol/L the better. While the egg is a great choice, wholemeal bread is not something we recommend; we encourage a lower carb diet for best blood sugar/A1c control. You may try adding some veggies or nuts to replace the bread… here are a few other breakfast ideas you might enjoy. Are we referring to a fasting reading or post meal reading of 6.5 mmol/L. Your goal (regardless if you have or have not been formally diagnosed with diabetes/prediabetes) is to maintain blood sugar levels (near) normal. If taken after fasting (in the morning, before food) then your goal is to maintain a level under 6.0 mmol/L. If taken 2 hours after a meal, then your goal is to maintain a level under 7.8 mmol/L. I had fasting blood glucose checked last week and it was 5.7. My GP said not to worry about it and the symptoms which I had she said is due to anxiety. Today i had fasting finger prick and the reading was 6.6 and I’m concerning about it. In case to lose weight, i have already lost 5-6 kg. without exercising. 5.5-6 mmol/l is still considered the normal range in many cases, which is likely why your GP said not to worry. Here is some more info on normal levels. Anxiety/stress can raise blood sugar levels. One finger prick test cannot give you a definitive answer either, as it can be influenced by many things – the foods you ate yesterday, the amount of sleep you had, the level of anxiety you have when testing, etc. Keep testing and logging and speak to your doctor again if you’re still concerned. Although under 6.1 is ideal for fasting levels, anywhere between 4-7.2 is acceptable. Are you eating a low carb diet Bob? Take a look at this food list. And if you need help figuring out food, take the 30 Day Turnaround Program – people are getting great weight loss results with it when they apply what they learn. Read Leisa’s story – she recently took the program. Hi , I m 25 years old .My sugar fasting is 120..Is it a serious.What should I do for it getting back to normal? Please suggest me. 101-125 is considered PRE-diabetes, which means there’s a lot you can do to prevent a diabetes diagnosis. Read this and this info. You might find this info and this info useful Madhu. Hey thanks a lot. The article was good. Even after having medicine my morning levels are same. Could you tell me whether to continue my running in the morning or in the evening? Yes, you should definitely see your doctor for more tests. Normal fasting blood glucose range is 4-7.2 (ideal under 6.1). After-meal levels no higher than 10 (ideal under 7.8), so as you can see, 17 is VERY high! 4 to 6 is considered normal levels Ahmed. 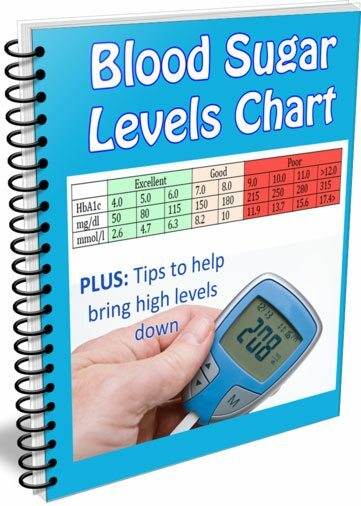 You can find blood sugar charts here. Hi Jedha, I must say the team is doing a great job. I came across a site that talks about blood sugar level chart and the thing is I really need your help to understand how to use properly. I hope my question is clear. Thanks in advance and I am gonna bookmark this site to check in later for reply to my question. Hi Clement, you can view our blood sugar charts here, along with lots of questions and answers. It is pretty easy to determine how to use them. Take your blood glucose reading and see which range you fall into – normal, prediabetes or diabetes. If you’re levels are above what’s considered normal, your goal is to take action steps to bring your numbers closer to normal, or within normal range if you can. I’m 28yrs after meal my blood sugar levels showed 6.6 it is normal? Under 7.8 post meal is ideal. Find the blood sugar chart here. Normally age is above 40 years. what is the diabetes normal value before fasting. Night taken dinner at 21.00. Early morning wake up at 6am check the blood sugar. isn’t correct method of blood sugar test? There is no normal age for type 2 diabetes these days, those risk does increase after age 40. You can view the normal blood sugar ranges over here. Do you mean 9.0 or 90 Zafar? If you mean 9.0, that is a higher than normal level. Exercise can temporarily raise blood sugar but the number is also influenced by what you eat during the day. Read this on blood sugar levels and this on exercise. 6.1-6.9 is prediabetic range. Definitely time to make a few changes and catch it before you reach a diagnosis. I need a meal plan. I’m at a 6.6 I don’t really know what the number means. As for 6.6 levels, maybe you need to read the post again. 6.6 is a pretty good number but if you can work on getting it lower 5-5.5 mmol/l fasting, and your 2 hour reading between 6.6-7.8 mmol/l, that would be even better. Hi what about folks who don’t have full blown diabetes, but have prediabetes, abs trying to reverse? Should we have stricter guidelines to achieve this? Hi Elizabeth, You should be aiming to get your levels in the normal range. The most important number to keep in mind is 140 (7.8). If you can get your fasting level between 70-100 mg/dl (4-5.5 mmol/l), and your 2 hour reading between 120-140 mg/dl (6.6-7.8 mmol/l) then that is optimal. See more about optimal levels over here. I have nerve damage in my foot and it keeps me up all night and those pills Gabapentin 600mg does not work for me I told my doctor and he gave them to me anyways again. Is there any other medications that could work? Hi Valerie, there are similar meds to the ones you’re on (Lyrica) and sometimes anti-depressants or pain meds are prescribed. Unfortunately we can’t advise on medications you should take as this is the realm of physicians who know your medical history. If you know the meds are not helping you do need to demand a different alternative, and if the doctor you’re seeing won’t help, there are other doctors to choose from.